Phnom Penh is Cambodia’s commercial hub and is set to lead the Kingdom’s success and development. The city is known to provide the country’s most potential business opportunities. 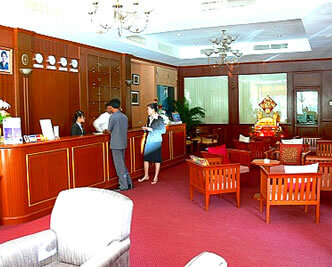 Bask in Phnom Penh’s busiest street is an 8-storey, 69 room La Parranda hotel, a competitive business hotel in Cambodia. La Parranda’s lavish rooms, fine-dining restaurants, amenities, coffee shop and special facilities provide the most exquisite Phnom Penh accommodations possible. La Parranda – Residence and Hotel is built perfectly for business and pleasure. It is also conveniently located at the city’s famous and busiest road, Mao Tse Tung Boulevard. The hotel is under an international hotel management team. We tender gratifying hospitality, convenience, comfort, security and friendly service. The lobby of the hotel is well lit and designed to make check in other activities there as convenience and comfortable to all hotel guests. Our well trained receptionists honor you with the warm welcome and an ease for your check in and other services to make your stay with us a totally hassle free and enjoyable one. Our room are designed in a simple yet stylish way to make all you stay not only a comfortable one but also one that make you feel right home. La Parranda Residence and Hotel is also an ideal choice for meetings, seminars and incentive groups with excellent facilities, enthusiastic support and fully equipped conference room as well as rounded restaurant. La Parranda Residence & Hotel in larger map.